The Republic of Uganda is a landlocked country in East Africa. 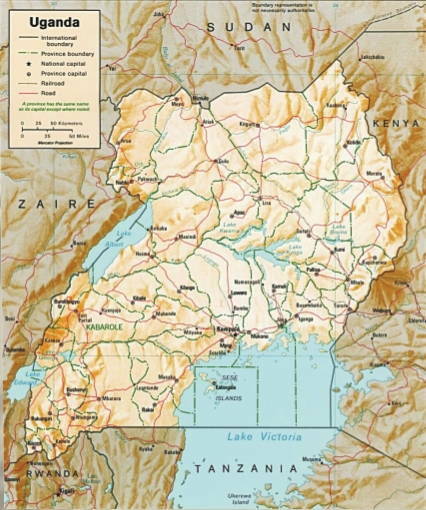 It is bordered on the east by Kenya, on the north by Sudan, on the west by the Democratic Republic of the Congo, on the southwest by Rwanda, and on the south by Tanzania. The southern part of the country includes a substantial portion of Lake Victoria, which is also bordered by Kenya and Tanzania. Uganda has a magnificent landscape, ranging from towering, snowcapped mountains to dense tropical forests. A great variety of wild animals roam vast national parks such as Kabalega Fall National Park in the northwest. Most of the country consists of a plateau about 4,000 feet (1,200 meters) above sea level. In the south, thick rain forests grow, and in the north grassy savannas stretch across most of the land. Within the Great Rift Valley lie Lakes Albert, Edward, and George. Part of Lake Victoria – the largest lake in Africa. Forms the southeastern corner of Uganda. The Victoria Nile and the Albert Nile and their branches. Drain most of Uganda. 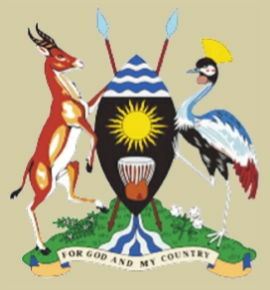 Uganda is a result of the unification of ancient kingdoms namely Bantu, Nitotic, Nilo- Hamitic Karamojong, and Sudanese peoples as well as many smaller independent chieftains. 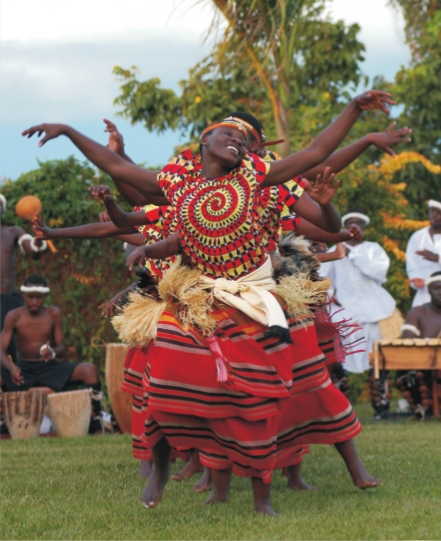 Ancient people with this own traditional lands their own customs and way of life inherited from their ancestors make Uganda a land of multiplicity of culture traditions and lifestyle this diversity is reflected in their languages, dance and customs. The largest cultural group is the Banganda people. Other ethnic groups include the kingdom, Toro and Banyankole, the Acholi, Basoga and Lugbara. 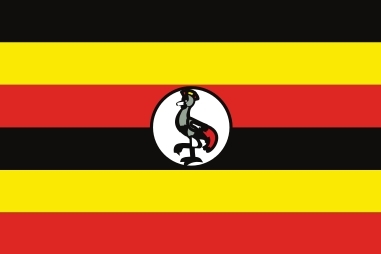 Most Ugandans are black Africans, but they belong to more than 20 different ethnic groups. 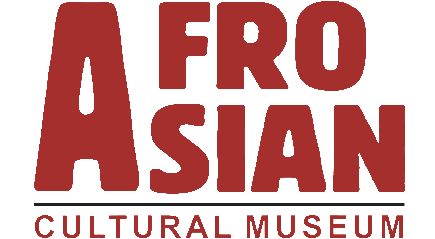 Almost every ethnic group has its own language. English is the nation's official language. 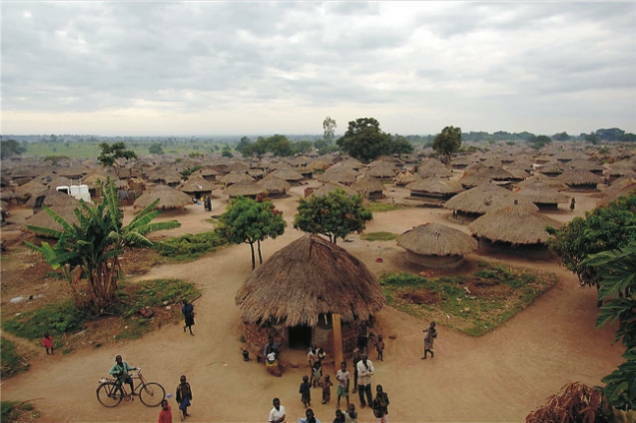 The Ganda the largest and wealthiest ethnic group in the country, make up about 30 per cent of the population and live in central and southern Uganda. They speak a language called Luganda, which belongs to the Bantu language group. Most Ganda are farmers. Ganda women do much of the farm work. Scattered around Uganda are monuments reflecting its colorful past, forts, tombs, sites of bloody battles, as well as interesting houses and churches. The kasubi Tombs in Kampala, the historic resting place of the kabaka ie kings of Buganda, are ranked among the countries best monuments Made of woven reeds these traditional structures are a fine example of regional skill and craftsmanship in building and architecture. 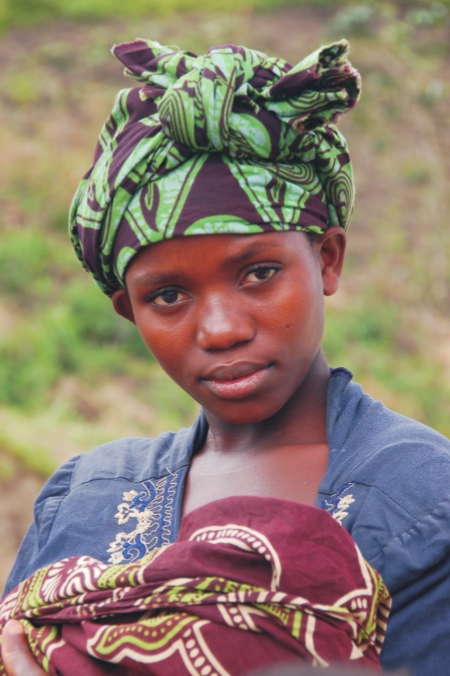 Way of Life Support for the extended family is among the most important values held by Ugandans polygamy is accepted and very common. The accumulation and display of wealth such as throwing a lavish wedding, are signs of success that win respect in Uganda. Most Ugandan's, whether or not they are Christians or Muslims, value the African religion of their ethnic group. Western attire is worn through out the country. 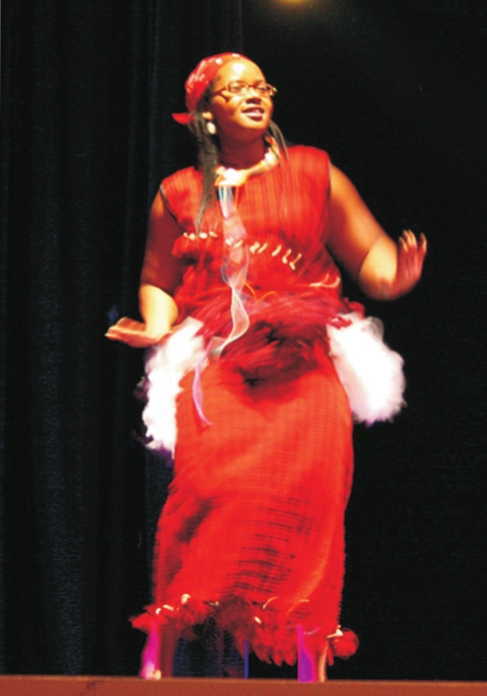 Traditional clothing which varies among ethnic groups is often worn at local ceremonies and dances. Traditional ganda and soga men often wear white robes called a Kanzu under the sport coat, while women wear a busuti a distinctive floor length dress introduced by 19th century missionaries. As a result of migration and intermarriage, most Ugandans have ancestors from a variety of uganda's 34 ethnic group groups. 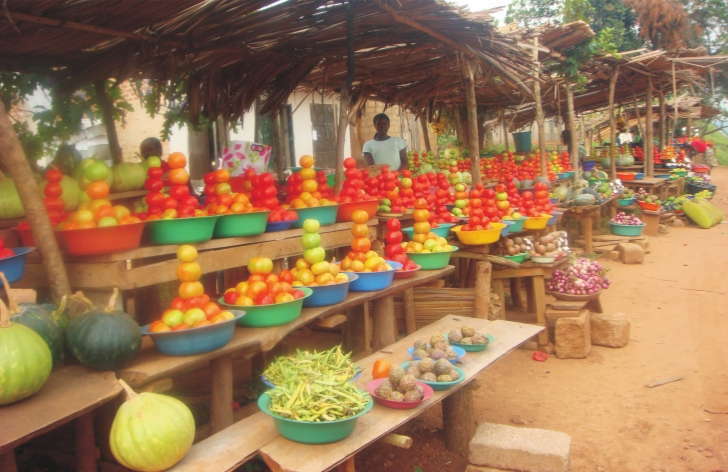 Many of the languages presently used are not mutually intelligible English is the official language of Uganda, though swahilli is more widely spoken and used as a lingua franca ( a language used in common by different people to facilitate commerce and trade) Luganda the language of ganda, is the most frequently used indigenous tongue. Spontaneous dancing and music are typical of life in Uganda. Colourful ceremonies that commemorate the past glories or celebrate the various seasons of the year are accompanied by lively music, colourful dances and feasting. The inbalu dance at the mass initiation ceremonies of the bagisu boys, on the slopes of Mt Elgon or be it the Runyega dances near Masindi are all part of Ugandas rich cultural heritage. Legends are part of Ugandas folklore Ugandas, especially the older generation. 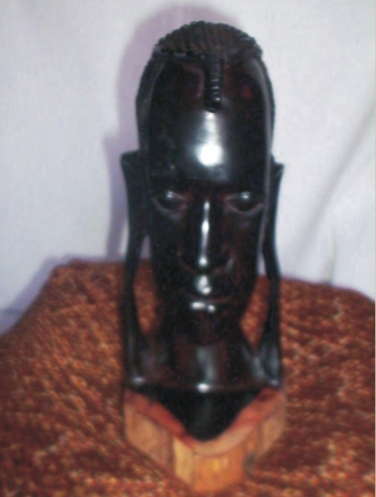 Love to recount many fables that reflect the daily life of the ancestors, such as stories of the chwezi people these fables not only entertain but also educate and impart social values Uganda's artistic expression today draws on the various traditional oral cultures; interwoven with western cultural Influences.